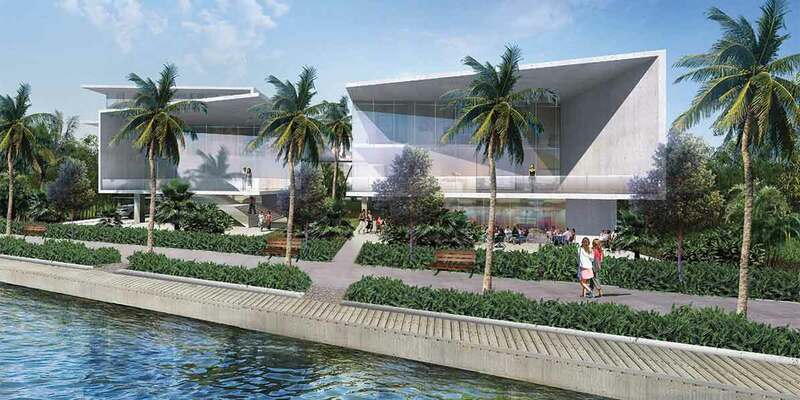 A fashion designer with A-list clientele was awarded the chance at a $1.5 million economic development grant from Miami-Dade County to help launch a new design studio and manufacturing facility on the Miami River. The catch is that designer Naeem Khan’s project won’t get the grant unless one of 10 previously approved projects fails to get built. The unanimous vote of Miami-Dade County commissioners Tuesday basically placed Mr. Khan’s NKMIA LLC on a waiting list for the funds. If the designer ends up getting the $1.5 million boost, the money would go toward construction of a new seawall and riverwalk, along with electrical infrastructure and sanitary sewer needs at the 1175 NW South River Drive site. Mr. Khan has a long-term lease for the county-owned parcel. The project received a warm reception Monday from members of the Miami River Commission. The plan includes reviving a long-dormant site on the river, with promises of jobs, construction of a public riverwalk and that the site will provide marine industry uses. Mr. Khan said there will be importing of supplies and exporting of finished product via the river, which river commission members were pleased to hear. The commission’s vote was limited to recommending approval of a county resolution approving the $1.5 million allocation to Mr. Khan, subject to recapture of funds in the economic development program. The vote was unanimous. River commissioners noted a desire to see the complete plan for Naeem Khan Studio when he is ready to bring detailed site plans for city review and action. Mr. Khan was on hand Monday and brought along members of his team, including architect Alfonso Jurado of Arquitectonica. Born and raised in Mumbai, Mr. Khan moved to the US as a teen to become a designer and launched his career as an apprentice for legendary American designer Halston at age 20. Mr. Khan eventually merged this design philosophy with the knowledge he gained from his family’s business to nurture his own style. “I feel Miami is the next big city for the fashion industry,” he told the river commission. Mr. Khan chose Miami to build his manufacturing facility and showrooms partly for the climate, which his team said will allow for year-round production. More specifically, he chose the Miami River location for the import of textiles and other materials, as well as the unique boating experience of ushering internationally famous clients in and out of his Miami haute couture house for fittings and fashion shows, the river commission was told. Mr. Jurado showed draft floor plans for the studio and production facility. The building will have show and sales areas, administrative offices, a production-design floor, and one suite for visiting designers, he said. The site has more than 200 feet of frontage on the river’s south shore and dockage is planned for potentially the entire length, along with a safety zone and the public riverwalk. Mr. Khan’s team has promised to extend the riverwalk under the 12th Avenue Bridge, connecting with a pedestrian staircase on the west leading back to the on-road Miami River Greenway, and the riverwalk will also have access back to the road on the east. River commission member Ernie Martin, chair of the Greenways Subcommittee, said the project meets the requirements of the city’s greenway plan, plus it will retain its marine-industrial zoning designation and include marine industry uses with imports and exports from the site via the river. Mr. Khan was asked about his timetable. He said he plans to be finished by 2018. River commission member and county Commissioner Bruno Barreiro spoke favorably of the studio plan, saying it would be “a real amenity” for the neighborhood. “We’re delighted to see development take place in this location,” said Mark Bailey, executive director of the Miami River Marine Group. The proposed studio and production facility “looks very interesting,” he said. Plans show that a vacant building on the site will be demolished for construction of four levels totaling 50,130 square feet. The county’s Economic Prosperity Committee voted last month to waive rules and put Mr. Khan on the list to share in $75 million from the Building Better Communities General Obligation Bond Program, designed to lure jobs. In applying for $1.5 million for infrastructure, Mr. Khan’s firm listed a project budget of $9.05 million in hard costs, with construction to take three years; $1.34 million in infrastructure, and $920,000 in soft costs. His application says 11 full-time jobs will begin in 2018, 35 more in 2019 and four more in 2020. Three workers would get $110,000, the rest $65,000 or below. The company now has no Florida employees. A list of Mr. Khan’s customers in his application includes First Lady Michelle Obama, Beyoncé, Taylor Swift, Lady Gaga, Queen Noor of Jordan and others. This is great news. Naeem Khan is a brilliant designer and the fashion community in Miami will benefit greatly from his presence in our city. Bienvenidos a Miami!